Arun Kumar, an assistant in editing room, was arrestd Tuesday for leaking 90-minute footage of Pawan Kalyan-starrer Telugu action-drama "Attarintiki Daaredhi" recently. "Through our investigation, we have found out that Arun Kumar, who works as an assistant in editing department was the one responsible for the leak of the film. In an effort to show his friends the rushes of the film, he uploaded the footage on YouTube," Rama Mohan, superintendent of police, CB-CID, said. "After he uploaded the video, some unknown person copied the video from YouTube on to discs and circulated in Pedana town in Krishna district, Andhra Pradesh, and other neighbouring districts as well," he added. On Monday, the leaked footage of the film was being sold at Rs.50. Police conducted searches at shops selling CDs and making mobile repairs and confiscated several discs. Following the leak, film's producer B.V.S.N Prasad filed a complaint with Director General of Police Dinesh Reddy and pressed for immediate action. 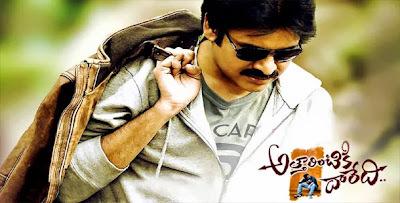 "Attarintiki Daaredhi" was scheduled for release Oct 9, but due to the leak it has been advanced to Friday. Directed by Trivikram, the film also features Samantha Ruth Prabhu, Pranitha, Boman Irani and Nadhiya. "Attarintiki Daaredhi" was originally slated for release on Aug 9, but it was postponed due to the ongoing political turmoil in the state.